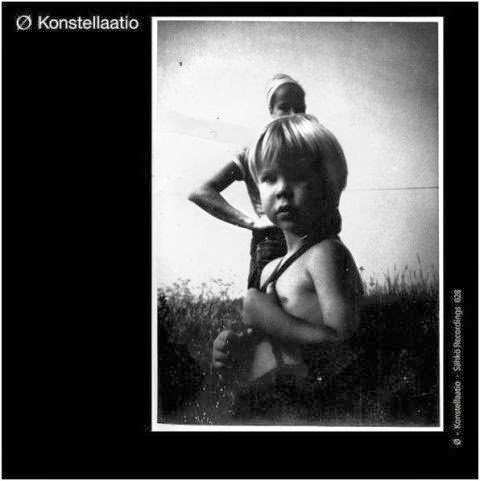 The artwork of “Konstellaatio” gives a clue to the foundations of Mika Vainio’s new album as Ø. It’s about summers in the Nordic countryside, grandma’s mythological tales from the memorable days between self-indulgence, when kids went picking wild strawberries under the burning sun, and suspense, when they were spying at a haunted house in the woods. Considering Vainio’s recent work, “Konstellaatio” is unsurprisingly of very different breed than Ø’s debut album “Metri” from 1994 or early EPs, which were in line with Sähkö’s rhythmic sci-fi fare of that time. Twenty years later Vainio comes with a constellation of life experiences, offering an inward-looking mix of Finnish melancholy and precise sound engineering where rustling passages interact with modern classical. While “Kilo” was a heavyweight homage to the maritime freight transportation, “Konstellaatio” sails in serene waters. One can encounter irregular bass thumps and Jarre-esque synth layers in ambient-minded “Otava”, or cold fragility in deep water explorations of “Syvyydessä Kimallus”. “Kesäyön Haltijat” moves closer to weightlessness and bleeping “Neutronit” reproduces CERN lab atmosphere. Modern minimalism emerges in “Elämän Puu”, floating in sacral manner over ten minutes, and in “Talvipäivä, Vanha Motelli” with fragile, even silent passages, followed by equally barren piece “Metsän Sydän”. The longing mood of “Syvänteessä Pukinjalkaisen” is troubled by a scary goat-legged creature entering the stage for the haunted house part while “Takaisin” is a tranquil conclusion of the album. Captivating, demanding, close to nature compositions.